The Puma Rotation 1/4 Zip pullover is perfect for cooler days on the golf course. 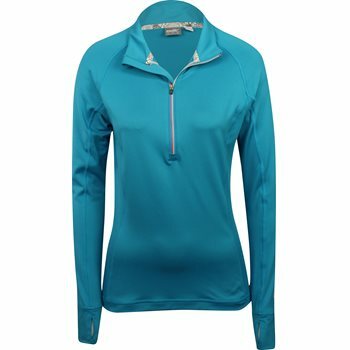 The soft, fleece brushed fabric will keep you warm and the DryCell moisture wicking will keep you dry when sweating occurs. The thumbhole construction helps keep your hands warm, allows your fingers to move with ease and secures your sleeve during each swing. The pullover is designed with logo branding at the left cuff, a two-tone zipper, and a ¼ zip placket that can be zipped for warmth or unzipped to show off a Puma undergarment.